Norwest School of Horology is Seattle’s only independent, non-profit school providing instruction in mechanical watch and clock repair. Our courses cover the theory of horology, watch and clock repair tools and techniques, and micro-machining skills. Students will learn how mechanical watches and clocks work and how to repair them correctly. Whether you are a beginner with a fascination for clocks or watches, a hobbyist with an interest in acquiring the skills needed to maintain your collection, a retiree looking for new adult-learning opportunities, or an experienced horologist with a desire to learn new skills and sharpen your technique, the instructors and volunteer mentors at Norwest School of Horology will help you develop your watchmaking and clockmaking skills at your own pace. To stay up to date on our class offerings please send an email to info@norwestschoolofhorology.com with the request, “Please Add Me To Your Mailing List” in the subject field. Our educational program is a “descendent” of the North Seattle Community College evening program in watch and clock repair that existed for over 35 years before budget constraints forced its closure in 2009. Rather than allow this valuable community asset to be lost, long-time instructor Tom Payne founded the Norwest School of Horology, a non-profit 501(c)3 corporation, to serve aspiring hobbyists, watchmakers and clockmakers throughout western Washington. Our well-equipped classroom is located in the Shoreline Center in North Seattle. 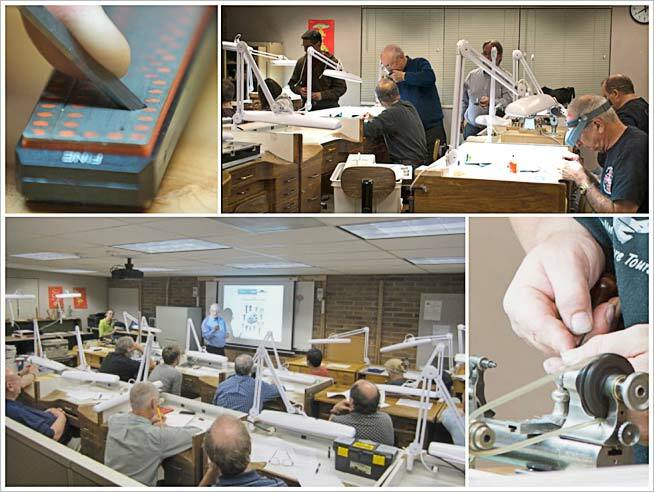 For most of our instructors and students, watches and clocks are a lifelong passion. Understanding “what makes it tick” and gaining the skills and knowledge required to repair and restore fine watches and clocks can provide a sense of pleasure and accomplishment that will last a lifetime. We hope you'll come join us, and begin exploring the fascinating world of watch and clock repair!